1. 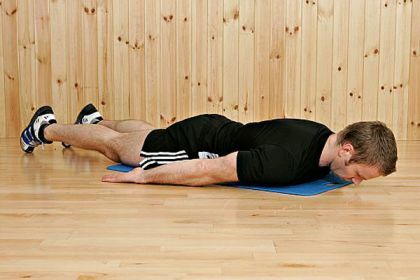 Begin lying face down with the back of your hands on the floor (figure 1). 2. While keeping your legs still, lift your shoulders and chest off the floor. Slightly tuck your chin as you lift. At the same time, roll your arms out so that your thumbs point towards the ceiling (figure 2). Hold for 4 seconds and then return to the start position. 3. Repeat 15 times unless specified otherwise by the chiropractor.